Aerial view of destruction from the Camp fire in Paradise off of Clark Road. 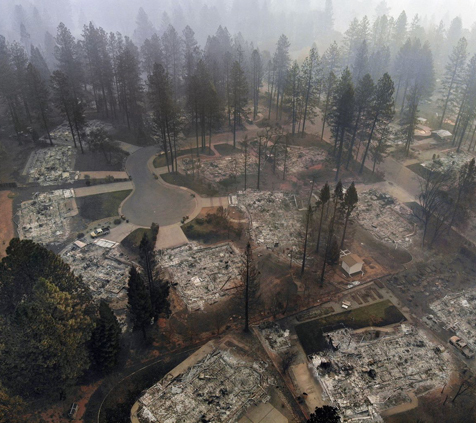 The Camp Fire has burned more than 7,000 structures in Paradise. Mother Nature Defends live trees not dead trees. The tree bark has a natural resistance to fire but our homes do not. Dry, under managed ground covers are easy fuel for a lazy wild fire, just like older unprotected homes that are in many more neighborhoods like Paradise, waiting for the perfect storm. California homes, needing wild fire resilient retrofitting, reminds me of when all freeway over passes needed to be retrofitted after the Northridge Quake. Until we address the real problems like needing to retrofit soffits and roof vents, we will continue to rack up unnecssary radical wild fire losses. A remarkable fact is that nature uses tannins (a class of polyphenolic biomolecules called polyphenols) in the bark of fire resistant trees, as a charring agent to generate graphite when charring during a wildfire. Graphite-carbon layers are known to be very poor heat conductors and serve to protect trees against fire. The graphite-carbon layers formed during the charring of tree barks provide a protective layer against the heat of wildfire flames, and also a protective layer against diffusion of combustible volatile compounds from the tree beneath the graphite-carbon layer, to the wildfire's flames. These tannins have additional properties which help fight against a wildfire and the volatile free radicals generated by the wildfire. Tannins are known to act as antioxidants and neutralize volatile free radicals generated by fire, via their electron donation ability. Therefore, during a wildfire, tannins may chemically reduce and deactivate free radicals formed during the combustion phase of fire, which otherwise would disrupt and ignite materials. Scientists are currently studying the significant variations in quantity and quality of tannins in tree barks in an effort to discover what additional chemical factors are active in fire retarding tree barks. By doing so, they hope to better understand the natural adaptation measures Nature takes against wildfire. Such new knowledge may someday help us to develop better and smarter building materials designed to withstand the mighty and powerful effects of wildfires, and protect our homes and communities in ways similar to how Nature protects seeds inside of certain pine cones, and living plant tissue beneath tree bark when exposed to extreme thermal energy and tempertures generated by a raging wildfire.